Kay Starr was born Katherine Laverne Starks on a reservation in Dougherty, Oklahoma. Her father, Harry, was a full-blooded Iroquois Indian; her mother, Annie, was of mixed Irish and American Indian heritage. When her father got a job installing water sprinkler systems for the Automatical Sprinkler Company, the family moved to Dallas, Texas. There, her mother raised chickens, whom Kay used to serenade in the coop. Kay's aunt Nora was impressed by her 7-year-old niece's singing and arranged for her to sing on a Dallas radio station, WRR. First she took a talent competition by storm, finishing 3rd one week and placing first every week thereafter. Eventually she had her own 15-minute show. She sang pop and "hillbilly" songs with a piano accompaniment. By age 10 she was making $3 a night, which was quite a salary in the Depression days. Although she had brief stints in 1939 with Bob Crosby and Glenn Miller (who hired her in July of that year when his regular singer, Marion Hutton, was sick), she spent most of her next few years with Venuti, until he dissolved his band in 1942. It was, however, with Miller that she cut her first record: "Baby Me"/"Love with a Capital You." It was not a great success, in part because the band played in a key more appropriate for Marion Hutton that, unfortunately, did not suit Kay's vocal range. After finishing high school, she moved to Los Angeles and signed with Wingy Manone's band; then from 1943 to 1945 she sang with Charlie Barnet's band. She then retired for a year because she developed pneumonia and later developed nodes on her vocal cords, and lost her voice as a result of fatigue and overwork. In 1946 she became a soloist, and in 1947 signed a solo contract with Capitol Records. Capitol had a number of other female singers signed up (such as Peggy Lee, Ella Mae Morse, Jo Stafford, and Margaret Whiting), so it was hard to find her a niche. In 1948 when the American Federation of Musicians was threatening a strike, Capitol wanted to have all its singers record a lot of songs for future release. Since she was junior to all these other artists, every song she wanted to sing got offered to all the others, leaving her a list of old songs from earlier in the century, which nobody else wanted to record. Around 1950 Starr made a trip back home to Dougherty and heard a fiddle recording of Pee Wee King's song, "Bonaparte's Retreat". She liked it so much that she wanted to record it, and contacted Roy Acuff's publishing house in Nashville, Tennessee, and spoke to Acuff directly. He was happy to let her record it, but it took a while for her to make clear that she was a singer, not a fiddler, and therefore needed to have some lyrics written. Eventually Acuff came up with a new lyric, and "Bonaparte's Retreat" became her biggest hit up to that point, with close to a million sales. In 1955, she signed with RCA Victor Records. However, at this time, traditional pop music was being superseded by rock and roll, and Kay had only two hits, the aforementioned which is sometimes considered her attempt to sing rock and roll and sometimes as a song making fun of it, "The Rock And Roll Waltz". She stayed at RCA Victor until 1959, hitting the top ten only once more with "My Heart Reminds Me", then returned to Capitol. Most of her songs have jazz influences, and, like those of Frankie Laine and Johnnie Ray, are sung in a style that sound decidedly close to the rock and roll songs that follow. These include her smash hits "Wheel of Fortune" (her biggest hit, number one for 10 weeks), "Side by Side”, "The Man Upstairs", and "Rock and Roll Waltz". One of her biggest hits was her version of "The Man with the Bag", a Christmas song, which is heard ubiquitously every holiday season in stores, restaurants, and on the radio. As the 1950s drew to a close, Kay Starr's popularity began to decline. She appeared in such television series as NBC's Club Oasis, mostly associated with the bandleader Spike Jones. However, Starr recorded several albums, including Movin’ (1959), an up-tempo jazz album. Others included Losers, Weepers… (1960) and I Cry By Night (1962) in the jazz/blues genre, as well as a country album entitled Just Plain Country (1962). After departing from Capitol Records for a second time in 1966, Starr continued touring concert venues in the U.S. and the UK. She also recorded several jazz and country albums on small independent labels, including a 1968 album with Count Basie, and Back To The Roots (1975). In the late 1980s she was featured in the revue 3 Girls with Helen O'Connell and Margaret Whiting, and in 1993 she toured the United Kingdom as part of Pat Boone’s April Love Tour. Most recently her first "live" album, Live At Freddy's, was released in 1997. Kay Starr performs Blue and Sentimental with Tony Bennett on his 2001 album Playin' with My Friends: Bennett Sings the Blues. 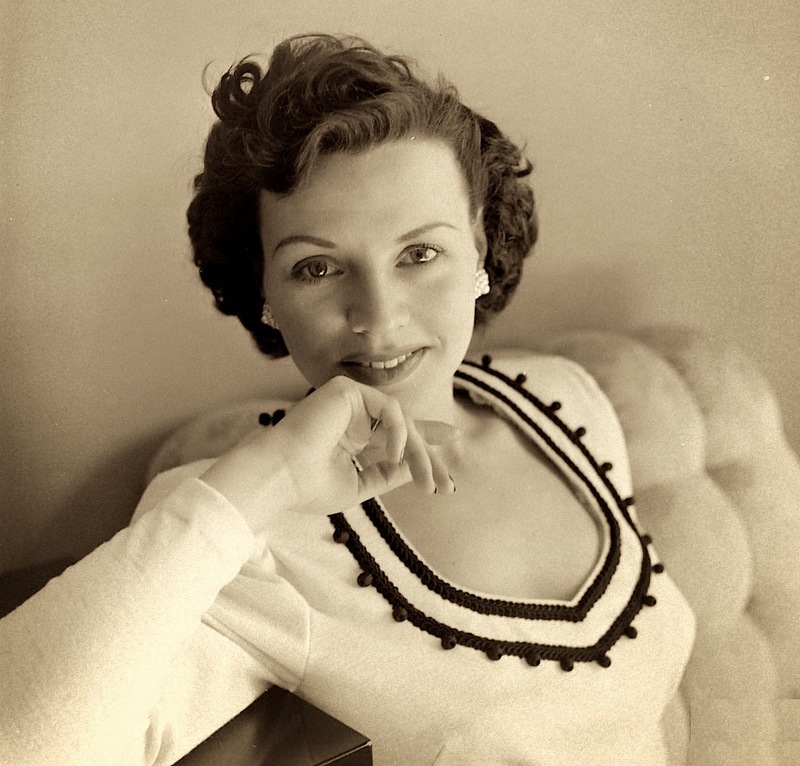 Click here to view Kay Starr's discography.